The slab is probably the easiest foundation to build. It is a flat concrete pad poured directly on the ground. It takes very little site preparation, very little formwork for the concrete and very little labor to create. It works well on level sites in warmer climates -- it has problems up north because the ground freezes in the winter and this freezing can shift the slab at worst and at least lead to cold floors in the winter. Around the edge of the slab, the concrete forms a beam that is perhaps 2 feet deep. The rest of the slab is 4 or 6 inches thick. 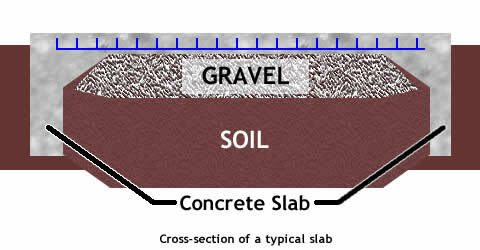 A 4- or 6-inch layer of gravel lies beneath the slab. A 4-millimeter sheet of plastic lies between the concrete and the gravel to keep moisture out. Embedded in the concrete is 6-inch by 6-inch wire mesh (shown by the dotted line in the slab) and steel reinforcing bars (shown by the white circles at the bottom of the beams). You will often hear this sort of foundation referred to as a "floating slab" -- it "floats" on the soil, with the deeper concrete around the edge holding it in place. In northern climates, the concrete around the edge has to extend deep enough to remain below the frost line in winter.